Erin Weaver (Elizabeth Darcy), Katie deBuys (Jane Bingley), Katie Kleiger (Mary Bennet), and Miranda Rizzolo (Lydia Wickham). Photo by Grace Toulotte. What happened after “Pride and Prejudice?” The beloved Jane Austen love story has certainly stood the test of time but we don’t know what came next, especially for the other Bennet girls. Mary, the middle daughter, is one that rarely appears in Austen’s novel but she becomes the focus of a new play. Lauren Gunderson and Margo Melcon’s “Miss Bennet: Christmas at Pemberley” tells the story of when Elizabeth’s sisters come to visit her and Mr. Darcy for Christmas two years after the end of “Pride and Prejudice.” What ensues is a gloriously charming and touching story of family and love. 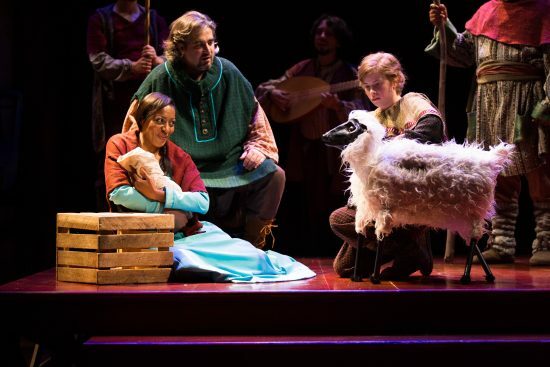 For anyone interested in a charming story set around the holidays, make sure to see this show. You won’t want to miss it. Mary Bennet is played by the delightful Katie Kleiger in her Round House debut. Kleiger is a strong actress who carried the show with great poise. Her ability to show us power in her vulnerability created an Austenian heroine for the 21st century. Erin Weaver filled the role of Elizabeth Darcy, having appeared in the Folger Theatre’s production of “Sense and Sensibility” and Marianne earlier this season. Weaver’s Elizabeth was just as bold and thoughtful as we recall from the novel but we get to see her even more in love with Mr. Darcy. Her husband was played by Danny Gavigan who portrayed Darcy’s stoic nature with ease. Katie deBuys appears as Jane, the elder and more romantic sister, who is very pregnant. Her husband, Charles Bingley is played by Brandon McCoy. Together this couple is just as gushy and adorable as fans could hope. They are so sweet together and both play their parts effortlessly. Miranda Rizzolo makes her Roud House debut as Lydia, the youngest and most frivolous Bennet sister. She plays the girl with childlike charm matched with a town gossip. She flitters about the stage. Rizzolo gives a strong performance and hopefully the DC area will get to see more of her. Mary’s love interest, Arthur de Bourgh, is played by the adorable William Vaughan. His portrayal of this gawky and bookish man was sweet and well-rounded. He is a man who makes how uncomfortable he is with his situation very clear in a realistic way. He also portrays the struggle of a man trying to become his own person but also abide by the standards that the culture has for him. Playwrights Gunderson and Melcon have crafted a gorgeous play in the same style and language of Austen that can be related to by people in 2016. There are many similarities to the plot of “Pride and Prejudice” that Mr. Darcy and Mr. Bingley easily poke fun at. The sisters also call out the fact that Kitty has completely left out of the story. With the rise of geek-chic, Mary and Arthur are relatable characters that we see paralleled in popular culture today. The set, designed by Daniel Conway, was beautifully overwhelming. It not only was massive but it had such details that the drawing room of the estate came to life. The set was completed with very tall Christmas tree at its center. Kendra Rai did an excellent job of designing the costumes. They were varied and each character had a distinct color palette. Regency era clothing is not simple. Rai’s attention to detail was stunning. “Miss Bennet: Christmas at Pemberley” is an instant Christmas classic. For anyone interested in a charming story set around the holidays, make sure to see this show. You won’t want to miss it. 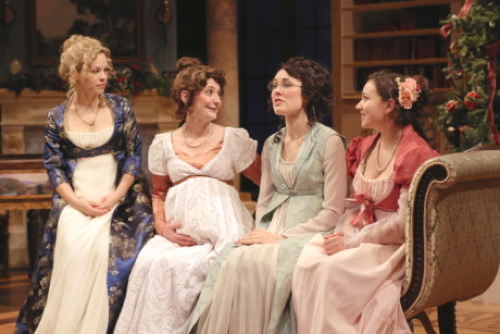 “Miss Bennet: Christmas at Pemberley” runs at Round House Theatre through December 18. For tickets and more information click here. Elle Marie Sullivan is a Silver Spring based teaching artist and actor. She earned her degree from the University of Central Florida in 2015.